Supporters across the world pitched in for his latenight performance. 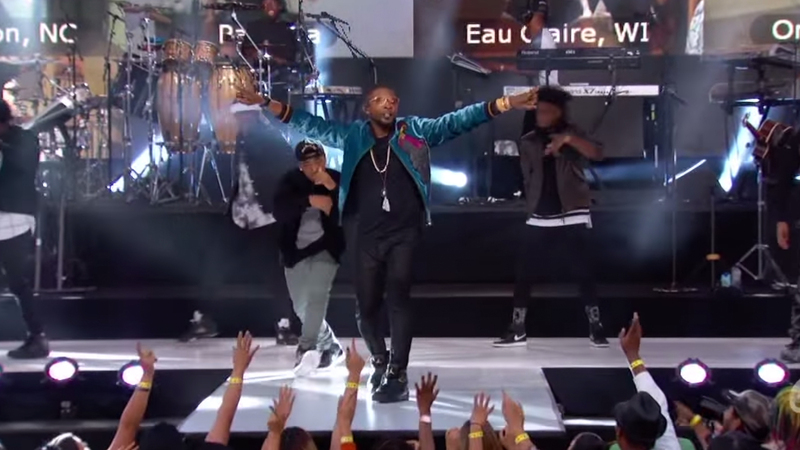 Usher performed his new single “No Limit” on Jimmy Kimmel Live! on Tuesday night, but there was one catch—he didn’t have Young Thug to back him up on the song like he usually does. How did he solve this problem? He asked his fans to act as stand-ins, naturally. A video montage of his fans dancing and singing was placed behind the “OMG” singer for the beginning of the song as he bounced around the stage as the cameras circled him. The fans who got a chance to be included lived in locations all over the world, from Florida to Canada to across the pond in London. After capturing a shot of the crowd inside, the camera worked its magic and swung back around to show Usher on Kimmel’s outdoor stage. Backup dancers joined the R&B crooner for some serious choreography while the fan-assisted montage kept rolling behind the performers. So, if any other artists have a collaboration track that they need to perform solo—just remember—your fans always have your back.